Welcome to the 215th issue SCUBA News. I hope you find it useful. Any questions or comments email news@scubatravel.co.uk. Madagascar, the world's fourth largest island, hosts one of the world's longest continuous coral reefs. The country is famous for her unique land animals, but her seas are also full of life not found anywhere else. Where to Dive in Antigua? The best diving in Antigua is in the south of the island, around English Harbour. The north is shallow and quite sandy, but calm and good for beginners. See which Italian dive centres have been given the five fish rating. For beautiful deep walls and oceanic white tip sharks. I wonder if anyone else feels this way about dive travel. 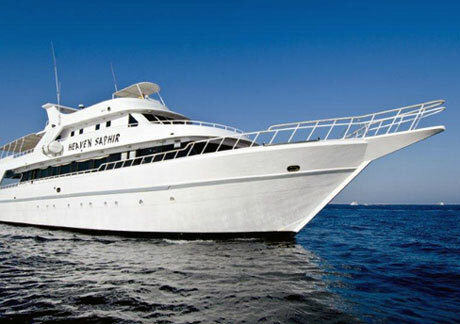 How many have booked dive travel through a shop? You are basically paying for the dive shop person to go on a trip and take their pics . I do not see any added value they offer. Would love to hear others views. 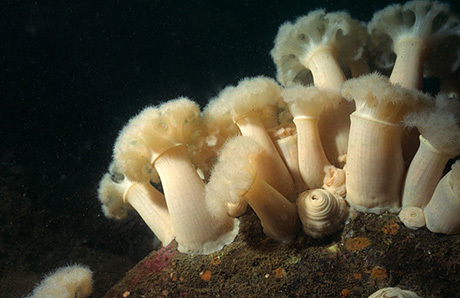 You often see small forests of Plumose anemones when diving in temperate waters. The is due to their ability to clone themselves. Genetically different patches of clones are often separated by narrow paths free of anemones. Along the edges of these corridors, the anemones often possess two types of tentacle. One type for catching food and one much smaller type which can expand tremendously. 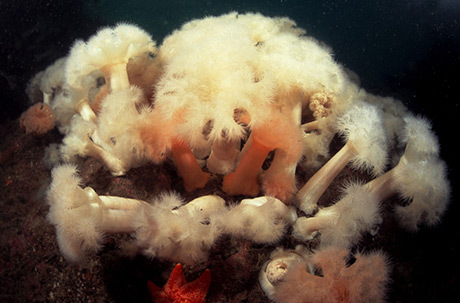 They use these expanding tentacles to reach over and attack non-identical anemones across the border. The tip of the tentacle doesn't hurt anemones the same as itself, it only discharges its stinging nematocysts upon contact with a genetically different individual. After stinging the tentacle breaks, leaving about 1 cm of the tip attached to the victim. The tissue around the sting dies as, occasionally, does the victim. 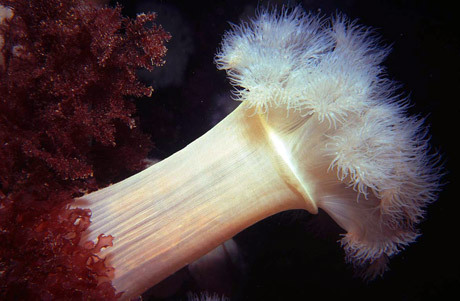 Plumose anemones comprise a tall, smooth column topped with a crown of feathery tentacles. When they contact they look like swirly blobs. With fine, delicate tentacles they are unsuited to capturing large animals like fish. Instead they specialise in smaller prey such as small planktonic crustaceans. 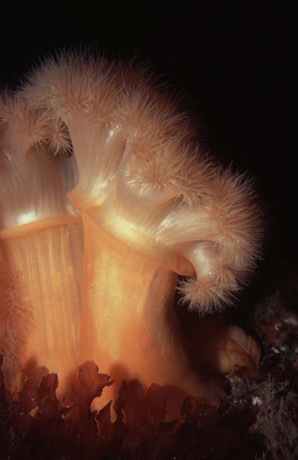 The anemone's columnar body is narrower just below the tentacles. A current will bend the stalk at this point and expose the tentacles broadside to the flow in the best position for feeding on suspended matter. The common name comes from pluma - feather. The Latin name, which it was given by Linnaeus, is Metridium senile which means Fruitful old - probably a reference to its cloning ability. There is some confusion as to whether this has been replaced by the name M. dianthus, but M. senile is still the accepted name according to ITIS - the Integrated Taxonomic Information System. M dianthus is listed as a different species but with "data quality indicators unverified". Read the full story here. 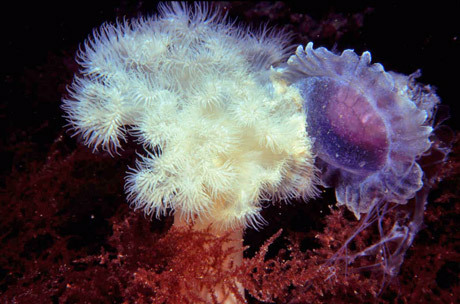 Previous creatures of the month are in our Marine Life section. Divers, and especially new ones, can experience dive anxiety at times. Dive anxiety though can be managed and overcome in time. Here are five techniques to make it a thing of the past. Everyone wishing to dive the conservation area of Sipadan in Malaysia must obtain a permit: only 120 permits are issued each day and from August the cost is rising. Where to dive in April & May? From Belize to the Red Sea - where to go and what you might see there in April and May. It's difficult to find an up-to-date book covering the diving all around Australia - this new publication remedies that.